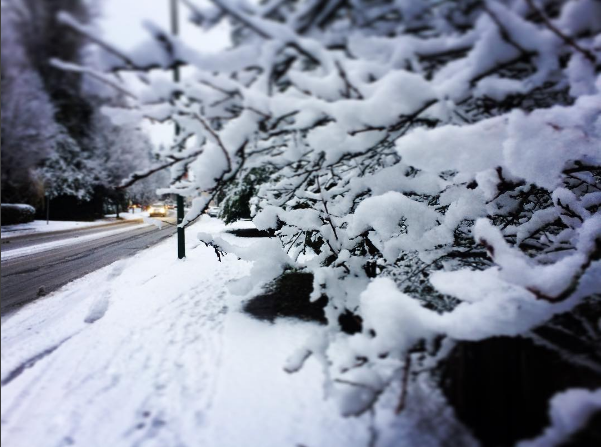 StuLand: An open letter: Snow in Vancouver is actually a big deal. An open letter: Snow in Vancouver is actually a big deal. OK, I know I’ve already lost some of you right from the headline. Or, you’re snorting to yourself in that ‘Okay, buddy, sure’ sort of way. Before you get all ‘Canadian Winter’ on me, hear this: I do know a thing or two about snow. I grew up in Kamloops, back when Kamloops got snow on the regular. The deep stuff, the cold days. And no, I never got a snow day from school. I also spent a few years in Edmonton. Props to the people of central Alberta. You know how to do winter. My shovelling muscles were never so well developed. Alberta, I’m pretty sure, is where block heaters were invented. -40 temps AND mountains of snow… I’ve been there, and I ain’t never going back. In summary, I know how to drive in it, I know how to shovel it, and I know how to bundle up against the cold. And here, my final disclaimer: Unless I’m skiing on it, I have no use for snow. I hate the stuff. Looking pretty on the trees is not enough payoff, as far as I’m concerned, for all the work that’s involved in dealing with it. Now, Vancouver. There are some things you need to know about Vancouverites before we talk about snow. 1.Of imported Vancouverites like me, I’m certain that most of us love it here because there’s only a small chance each year that we will get any hint of the white stuff. Bring on the 400mm of rain, I say. It, at least, has the decency to head for the drain as soon as it’s hit the ground. We Vancouverites like it between 17-22 degrees, with variable sun, cloud, or showers. And that’s how it is, most of the time. Bland, predictable, not too hot, not too cold. 2. Along with that, we like our transit options, we like our bike lanes (well, some of us), and we like having to mow our lawns, year-round. Whenever the words ‘Snow’ and ‘Vancouver’ are uttered in the same sentence, it’s usually because someone is making a joke, or rolling their eyes at the chaos that always ensues during a Vancouver Snow day (see video below for just a touch of that). 3. Snow in Vancouver… isn’t snow (skip to 6. for the full explanation) Not like most Canadian’s know it, anyway. And Vancouverites don’t even receive it each year, which makes everyone extra-panicky when the snow shows up. 4. Obviously, many Vancouverites do create their own problems around snow. Many do not own snow shovels, far too many people think they can get away with all-season tires, or worse, and the locals think a credit card makes a good windshield ice scraper. This is still Canada, and that laissez-faire attitude is just stupid. And when Vancouver “snow” falls, those tires just don’t cut it, and having no shovel or salt for your sidewalk is just plain neglectful. 5. The City of Vancouver, as an entity, creates its own problems. It’s fleet of 49 salt/sand/plough trucks are, for whatever reason, are never quite ready to go on time, and they never quite manage to actually plough/sand the whole city, no matter how long the snow lasts. I can pretty much put money on the fact that my street will never. ever. see a plough or drive-by sanding. 6. You see, the snow that falls out of the sky in Vancouver isn’t like the snow you get anywhere else. Our snow is a form of white Teflon. There are those folks who just recently moved here from “somewhere else” with their pickup trucks and ‘Vancouverites don’t know how to drive in the snow’ attitudes. These are the first people to be humbled. I see you in the ditches. I see you spinning out on gentle slopes. I see you doing your paperwork on the sidewalk after you’ve just rear-ended someone because you figured you could stop in time. I even see you spinning your tires, just trying to get out of your parking spots. Because, sometimes, the snow is so slick, even good snow tires are made impotent by our special brand of wintery goo. As evidenced by the recent viral video of downtown Montreal, where two buses, a commuter car, a police car and a tow truck all slid into one another, NOBODY knows “how to drive” in that kind of snow. That snow was out of the ordinary for Montreal. Here in Vancouver, that’s basically the only kind of snow we get. sure, it looks pretty...BUT WHAT GOOD IS THAT TO ME?! First, it falls slick as snot, causing initial commuter chaos. Then, it becomes slush within hours, clogging drains across the city. Then, if we’re lucky, it freezes, turning the entire city into an ice rink. I’m going to go ahead and say that the majority of Vancouverites hate snow. My modest-sized house on my modest-sized lot—just like all my neighbours’—is worth millions. Surely, with all that expense, we shouldn’t have to deal with snow, too? Oh, the injustice. The only real winners in Vancouver snow are the kids who head for any local hill they can find, using anything they can get their hands on, to do some sledding. Cardboard, plastic bags, crazy carpets, cut-up milk jugs… anything that could be perceivably used as a sled. And the payoff is big. Within just a couple of runs, the Teflon snow has condensed, and kids are setting land-speed records that would make Clark Griswold jealous. And snowmen? You’ve never seen packing snow like this. You can roll an entire field of snow into a single ball that won’t break apart (but don’t get too excited, that snowman will melt the same afternoon when it starts raining). So the kids have fun with the snow, and that’s as it should be. We miss our walks on the beach, and we just want to get back to having clear sidewalks and roads. It’s hard to get to the marijuana dispensaries and Starbucks with all this muck underfoot. So please, Canada, take pity on us, and thanks for listening.